We offer you an amazing tour that is not just a ride between significant sites but an enjoyable travel that will amuse you. Whether it's to Shirakawago, Takayama, Hakusan Onsengo, or Kanazawa, we plan meaningful itineraries arrived at utilizing the scenic route along the toll road, Hakusan Shirakawago White Road. We believe that such excursions will eventually lead to a great reputation from our passengers. We want to help you make your travel worthwhile and unforgettable! 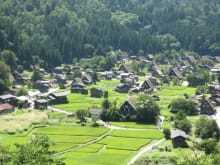 Day Trip to Shirakawago, Gokayama or Takayama from Kanazawa! Shirakawago was beautiful and it was so great to see snow! I would have liked to have more time to explore Takayama, we were dropped off too far away to walk to the historical village so we could only explore the shopping strip. Toasting rice crackers was fun but it would be even cooler to see the factory where the made the dough and then toast our own. Actually the One Day Tour was been in happy family holiday but we are a moslem and that the Lunch did not prepare for the Moslem Lunch, we could not eat the pork. The trip fo Shirakawago was excellent! The view in real is exactly like what you see from the websites or any photo! Served lunch was very tasty and I didn’t expect them to be a full course meal, and the restaurant itself is just so wonderful! Tour guides (one Japanese speaking & English speaking) are assigned to us eventhough the group didn’t meet the minimum group to have English speaking guide, we are very grateful for this! They are both very friendly and approachable! We were a bit disappointed when we booked and received a confirmation saying that the tour would be in Japanese. However, on the day of the tour, the tour leader was kind and spoke English very well, she explained/ translated every now and then, so we enjoyed the tour very much. This is a kind of tour which your need to take, as it may be difficult to use public transportation.